And this dish is always appreciated for its fanciness; that classy dish that can be a favorite for any one of these special nights' dinner. Linguine vongole, spaghetti vongole... it's your choice! Both pasta taste great with this recipe. Adding a few fresh clams in their shell to the pasta really helps the vongole presentation, to make your dish even more appealing, but, let's not say this too loud: cans of clams are really all you need. 2) Saute the chopped garlic and parsley with 2 ounces of butter and 2 tablespoons of extra virgin olive oil (to help prevent the butter from burning). 3) Cook the sauce a bit, allowing the sherry and clam juice to evaporate a bit, thus allowing all flavors to concentrate. At this point reduce heat to medium-low, gently mix in canned clams, pepper and salt. Cook just enough to heat clams thoroughly (no more than 5 minutes), as they will be hard if cooked too long. Use the clams you have cooked previously and use them to garnish each plate. Do not forget to discard all clams that didn't open after being cooked. Follow package instructions to cook the linguine, with a bit of salt and a teaspoon olive oil. When linguine is al dente, drain and pour into large pasta mixing bowl. Mix in clam preparation. 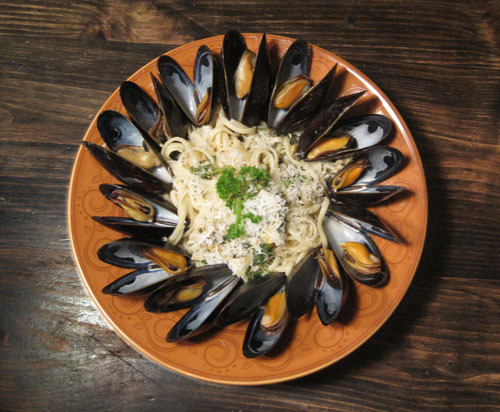 When preparing each plate, put a few fresh clams on top of the pasta... mmmm picture perfect linguine vongole! Serves 4 to 6... do not forget an excellent white wine to accompany your spaghetti vongole!